At VMworld in Barcelona yesterday, VMware executives fleshed out the company’s software-defined datacentre vision of storage virtualised from the server hypervisor. This will provide pools of data capacity in native virtual disk format from underlying heterogeneous SAN and NAS devices and even server direct-attached storage. 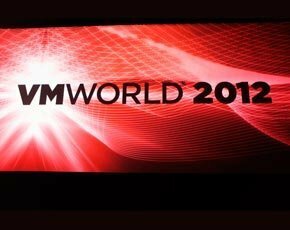 VMware product marketing manager Shruti Bhat told an audience – largely made up of VMware administrators and storage administrators – that the server virtualisation giant’s efforts aimed to reduce the pain and time involved in provisioning storage for virtual machines (VMs). “In theory it takes two minutes to provision a VM, but in reality it takes more like five days, because you have to provision its storage, security and availability,” said Bhat. Bhat pointed to storage provisioning tasks – such as building disk pools, setting Raid levels and LUN configuration – that all add time to VM creation. “Traditional storage is not keeping up, especially with the needs of virtual desktops and Hadoop,” she added. VMware product marketing manager Alberto Farronato fleshed out hints during the morning’s keynote from CEO Pat Gelsinger, about forthcoming storage management features from VMware over the next few releases of the hypervisor. Farronato described in detail the company’s vision for storage management from the hypervisor to create and manage pools of storage from multiple vendors’ SAN and NAS devices, as well as server DAS. VMware's vision comprises three key planks. Storage-based policy management would create policy-based orchestration with storage profiles based on performance characteristics tied to specific VMs. Virtual Volumes would see enhancement of SAN and NAS to run VMDKs natively rather than use LUNs. A new API would be developed to allow storage operations to be based on VMDKs, with operations such as snapshots, thin provisioning and data deduplication provided via the VMware hypervisor or third-party products. Meanwhile, Virtual Flash capability would present server-side flash as a single pool, from which reservations and shares could be managed for virtual machines. Finally, Virtual SAN capability will create a pool of storage from scattered direct-attached storage capacity on servers to provide highly scalable disk capacity from distributed disk drives. “Virtual SAN is a bigger version off the vSphere Storage Appliance, integrated with vSphere and built for the enterprise,” said Farronato, citing potential use cases including virtual desktop storage and big data.